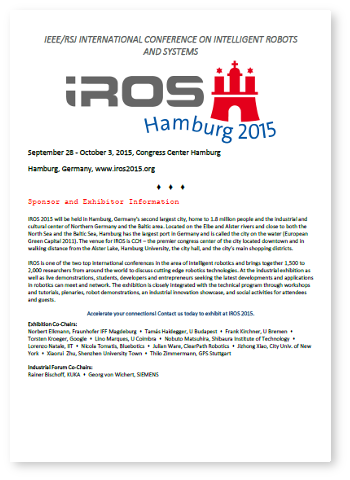 The IROS 2015 will be held in Hamburg, Germany's second largest city, home to 1.8 million people and the industrial and cultural center of Northern Germany and the Baltic area. Located on the Elbe and Alster rivers and close to both the North Sea and the Baltic Sea, Hamburg has the largest port in Germany and is called the city on the water (European Green Capital 2011). The venue for IROS is the CCH, one of the few congress centers located in the city centre and in walking distance from the Alster lake, Hamburg University, the city hall and the main shopping district. Download the Call for Sponsors here. IROS is one of the two top international conferences in the area of intelligent robotics and brings together 1.500 to 2.000 researchers from around the world to discuss the cutting edge in robotics. Through the industrial exhibition as well as live demonstrations, students, developers and entrepreneurs seeking the latest developments and applications in robotics can meet and network. The exhibition is closely integrated with the technical program through workshops and tutorials, plenaries, robot demonstrations, an industrial innovation showcase, and social activities for attendees and guests.